Microprocessor technology together with rugged construction ensures accuracy and durability in the roughest environments. Self contained packaging provides convenient access to everything you need to conduct a test. Auto Shut Off - extends battery life. Meets Standard Method 4500-CI G. DPD Colorimetric Method for measuring residual chlorine. New Powder Pop Dispenser simplifies the handling of DPD reagent. The new Pocket Photometer gives you laboratory accuracy, no matter where you happen to be. 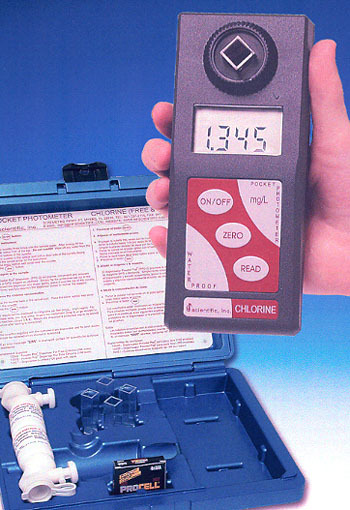 The Chlorine Pocket Photometer is packaged in a rugged, self-contained kit which together with the Powder Pop Dispenser, has everything needed for measuring Free or Total Chlorine. Reagent for the Pocket Photometer is packaged in the PPD-2 Powder Pop Dispenser. The PPD-2 Powder Pop Dispenser delivers a precise dose of DPD reagent directly to your sample with the push of a button. No foil pouches to tear open and no mess to leave behind. The PPD-2 Powder Pop Dispenser is formulated to include enough reagent for either 100 or 200 tests. Available for free or total chlorine.